The Kenyan interior ministry said on Sunday that one of the Garissa attack gunmen was the son of a Kenyan government official. The news was announced as Easter services dedicated to the 148 victims of Thursday’s terrorist attack on Garissa University College were held nation-wide, ushering in three official days of national mourning. Churches across the country hired armed guards to protect their congregations, fearful of more attacks after a massacre that specifically targeted Christians. On Thursday, four masked gunmen stormed the university campus in the eastern town of Garissa, close to the border with Somalia. In the initial shooting rampage, many students were killed almost instantly, but the militants went on to instigate a day-long hostage situation — making clear that they were targeting non-Muslim students. Somali-based extremist group al Shabab quickly claimed responsibility for the attack, stating that the massacre was revenge for Kenya having sent troops into Somalia to assist African Union peacekeepers against the al Qaeda-affiliate. Al Shabab is mostly active in Somalia — according to the Council on Foreign Relations they hope to transform the poverty-stricken country into an Islamic state — but has previously carried out attacks in both Kenya and Uganda. In a statement released Saturday, the group promised more attacks in the future, warning Kenyans that their cities would “run red with blood,” according to Al Jazeera. 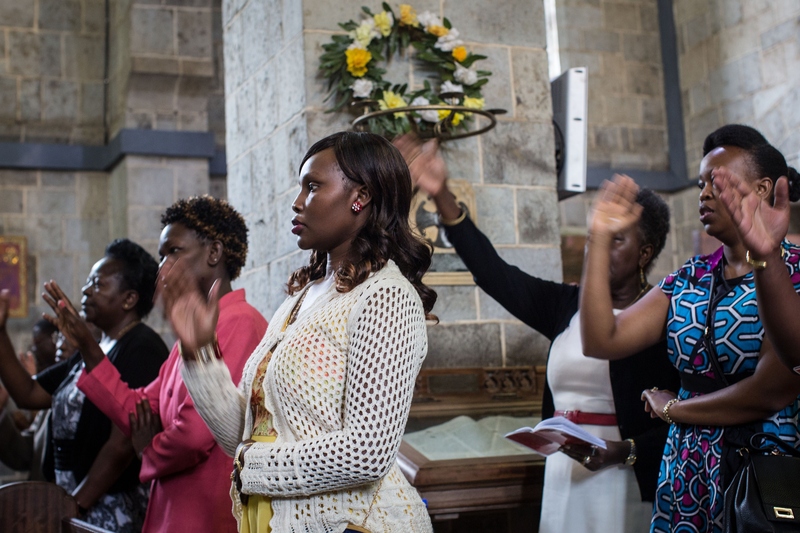 We are very concerned about the security of our churches and worshippers, especially this Easter period, and also because it is clear that these attackers are targeting Christians. The Garissa attack was the deadliest on Kenyan soil since the 1998 bombing of the U.S. Embassy in Nairobi; carried out by al Qaeda, that strike killed over 200 people and wounded many more. In the light of al Shabab's threats, Kenyan police have said they are also ramping up security at shopping malls and public buildings in Nairobi and in the eastern coastal region. Authorities are rushing to acquit themselves well in the aftermath of Thursday’s attack. On Friday, Interior Minister Joseph Nkaissery said that Kenyan police had arrested five suspects in connection with the attacks. They had also posted a “most wanted” notice for one Mohamed Mohamud (also known by the alias Mohamed Kuno) in connection to the Garissa attack. A reward of around $215,000 was offered, although specifics of the man’s involvement were not given. Update: An interior ministry tweet Sunday names Mohamud as the attack's mastermind. Garissa University has been closed indefinitely, while a dusk-to-dawn curfew has been imposed on the surrounding region. Hours after al Shabab issued its warning of further blood-shed, police in Garissa piled the corpses of the four gunmen into a pick-up truck and paraded them through the town. The macabre display was ostensibly to see if anyone could identity the attackers, but an Al Jazeera correspondent suggests that it could equally have been the easiest way to prove that the gunmen were dead — and inject the terrified crowd with confidence in the security forces. The father had reported to security agents that his son had disappeared from home … and was helping the police try to trace his son by the time the Garissa terror attack happened. But the country’s security forces have faced criticism over their response. French news agency AFP reported that it took special forces several hours to arrive at the Garissa campus. They flew in from Nairobi, and only arrived after other security personnel had been battling the militants for hours. Many of the country’s newspapers published unfavorable articles Sunday. "This is negligence on a scale that borders on the criminal," a Nation editorial read, "... the gunmen, who killed scores of students with obvious relish, took their time." An attack happens, we are reassured of security. Security will be beefed up. Some high-profile figures will come from Nairobi. They land here for a few hours and go back, only for this thing to happen a few days later. Kenyatta has declared three days of official mourning for the attack, starting Sunday.